The screenshot looks crowded? Note that virtually all elements can be hidden. XYplorer with Tabs, Mini Tree, Tree Path Tracing, Breadcrumb Bar, Color Labels, Size Graphics, Hover Box, Tags, and Comments. Floating Preview to the right, with Photo Data. Tabbed Browsing: Have an unlimited number of tabs to make jumping around between folders a one-click affair. 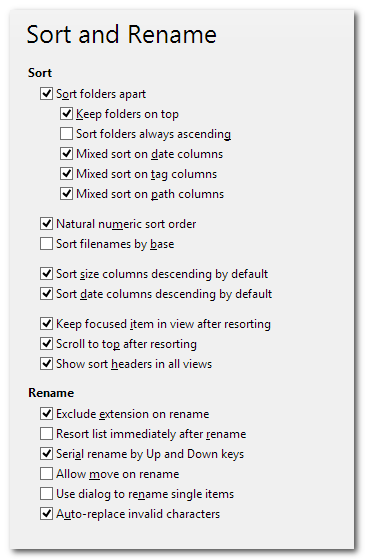 Rename the tabs, drag-shift them around, hide them, lock them, drag and drop files onto the tab headers... the tabs remember their configuration individually and between sessions, and multiple selections are retained on tab switches. Tabsets: You can save and load any number of tabsets. Dual Pane: Have the contents of two folders side by side (horizontally or vertically), and move or copy your files comfortably and safely from pane to pane. Both panes are optionally multi-tabbed and can be arranged vertically or horizontally. Searches in Tabs: You often search your system for files added in the last 24 hours? You quickly need a list of all text files containing your name? Let a "finding tab" do this or any other search job at a single click! The Address Bar accepts not just folders, but also files, scripts, filters, and search terms. Yes, you can enter search patterns directly into the Address Bar. Simply put "?" between location and search pattern (Boolean operators and Regular Expressions allowed). Additionally, there’s the revolutionary 6 Key Navigation, 4 Key Navigation, and Mouse Click Navigation. The Tree and List offer a suite of unique highlighting options to increase visual grip. Highlight Folder, Boxed Branch, Favorite Folder Bold, Highlight Focused Row, Highlight Sorted Column, Colored Grid, ... all colors are fully customizable. There is configurable Color Coding for files and folders. And there is the wonderful Tree Path Tracing™. Catalog: Your favorite locations reside deep down in some heavily nested structures? Lift them to the surface! Your current project forces you to repeatedly ride from one end of your hard disk (or LAN) to the other? Join those ends within the flat hierarchy of a Catalog Category, and reduce their mutual distance to 18 pixels! Which means you got an easy one-click access to your most commonly used folders while maintaining a synchronized tree view! By the way, you can also drop stuff onto the Catalog’s items: file management cannot get any cooler! Breadcrumb Bars: You can have a Breadcrumb Bar in each pane. 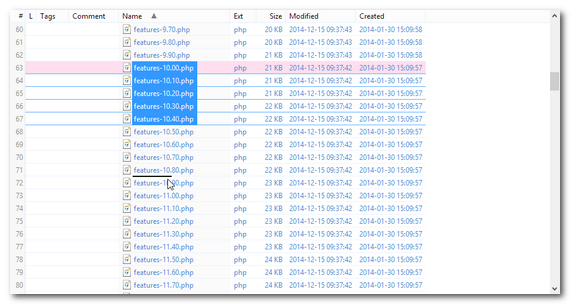 It shows the full path of the current tab and lets you efficiently navigate the whole file system. Info Panel: The hideable tabbed panel at the bottom provides quick access to information (file properties and previews) and action (Find Files, Reports). If you need a fast and friendly image browser, sound browser, or video browser, it’s here: Instant, one-click preview of image (incl. PNG, JPEG, GIF (incl. Animated GIFs), TIFF, TGA, ICO, and photo formats like CR2, CRW, DCR, DNG, ERF, FFF, MEF, MRW, NEF, NRW, ORF, PEF, RAF, RAW, RW2, RWL, SR2, SRF, SRW, X3F, etc depending on your installed codecs, using high-quality resampling for scaling), audio (incl. WAV, MP3, OGG, APE, etc. ), and video (MPG, AVI, MOV, QT, VOB, TS, WMV, etc. ... not to forget FLV/YouTube) files, with display of detailed media information. It’s a non-indexed search, so your search results are always live and up-to-date. You can save your current search settings to a Search Template or in a Finding Tab for later one-click re-use. Very handy with complex search patterns or distributed search locations. 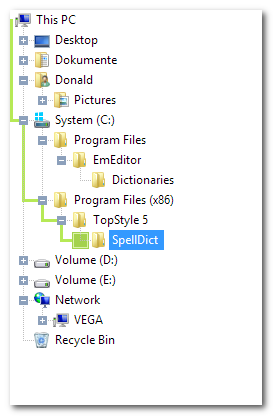 Intuitive Search: Recently, many Windows users are frustrated with the search in Vista/Win7/Win8. 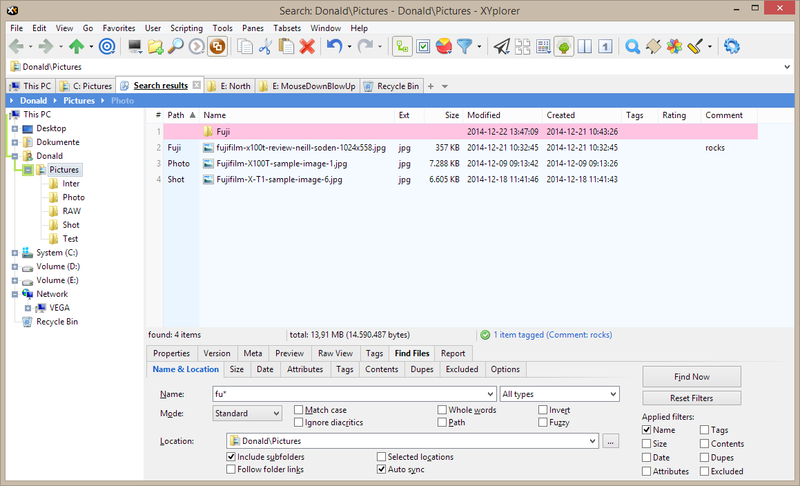 Well, XYplorer’s search works as you might know it from XP: Enter a search term, press ’Find Now’, and find what you are looking for! It’s easy because you already know how to do it. 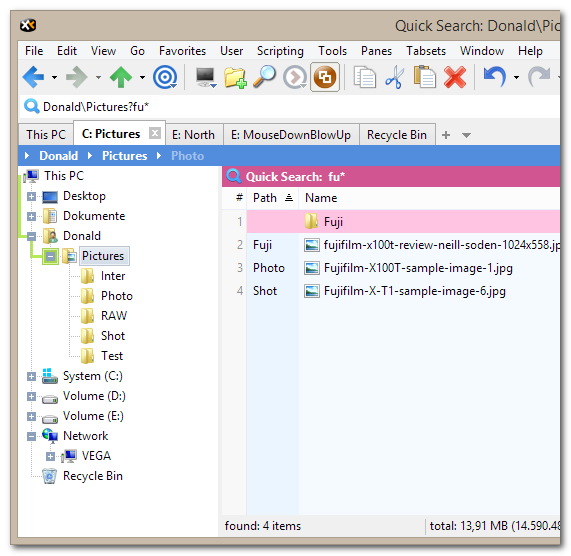 By the way, the minimalist Quick Search (F3) interface provides an alternative to the mighty and powerful Find Files tab. On top of the factory buttons you get Custom Toolbar Buttons, where you define how the button looks and what it does when pressed. And, optionally, the toolbar can be scrolled. 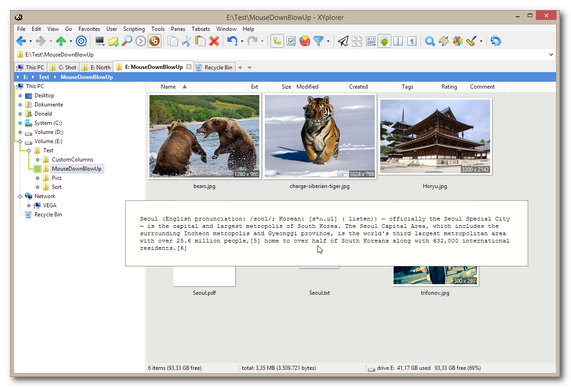 Floating Preview: The Floating Preview, quickly toggled by F11, shows the current file in a non-modal preview window whose size and absolute screen position is stored between sessions. It supports all types of images, and snapshot previews for HTML, PDF, MPEG, DWG, etc., everything your system can generate thumbnails for. 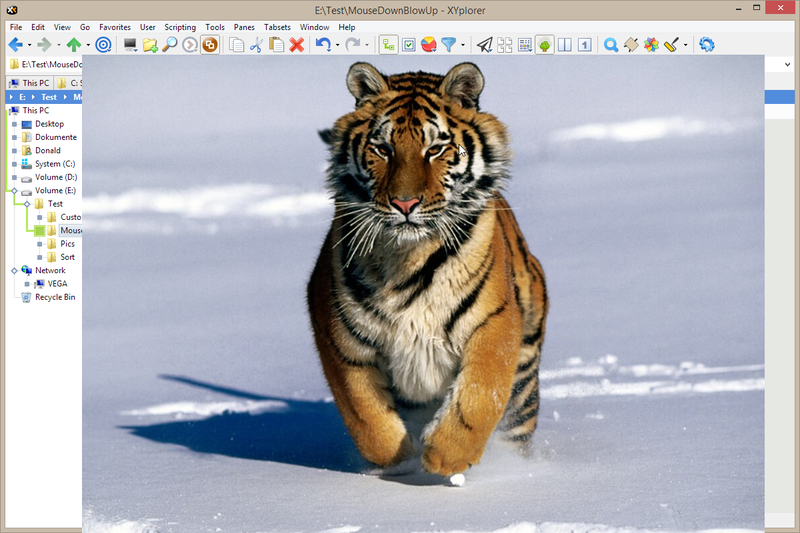 Resizing the window resizes the preview in real time. 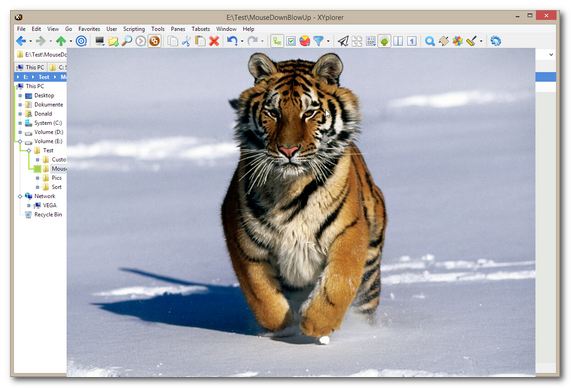 The Floating Preview supports Mouse Down Blow Up and the Transparency Grid for transparent images. XYplorer gives you multi-level undo/redo for file operations Move, Copy, Rename, Delete, and New. Up to 100 user actions are logged and can be undone at any point. They are even remembered between sessions so you can fix today what you broke yesterday. Thanks to background processing you can continue working in XYplorer while heavy copy jobs are processed in the background. Background file operations can optionally be processed sequentially (in a queue), which is often far more efficient than processing them in parallel. With queueing enabled successive operations are lined up in sequence and completed one after the other. E.g. if you initiate a job, say a Copy operation, while another one is still in progress, the new one will be delayed until the other one is finished. This is also known as asynchronous copy. Without queueing background file operations are processed in parallel. Parallel processing can be quite inefficient and may put unnecessary stress on your hard disks because of excessive head movements. 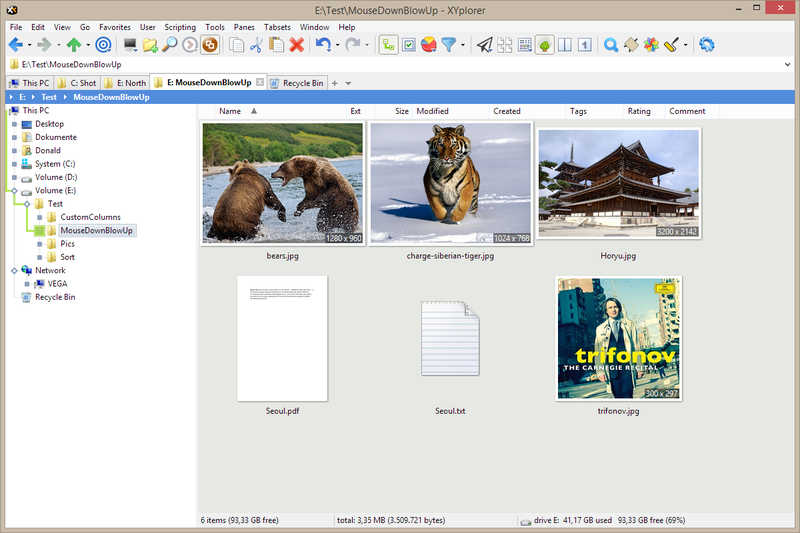 In 2008 XYplorer wrote file management history by introducing a truly revolutionary feature, the Mini Tree. The Mini Tree displays only the paths you have actually used. You might call it a tree shaped history. It makes browsing blindingly fast (it’s instantaneous even with deeply nested subfolders), it makes the tree ridiculously small, and it makes you feel like being back in control because you look at just the folders you are actually using, instead of being avalanched by all the folders that have accumulated on your drives over the years. 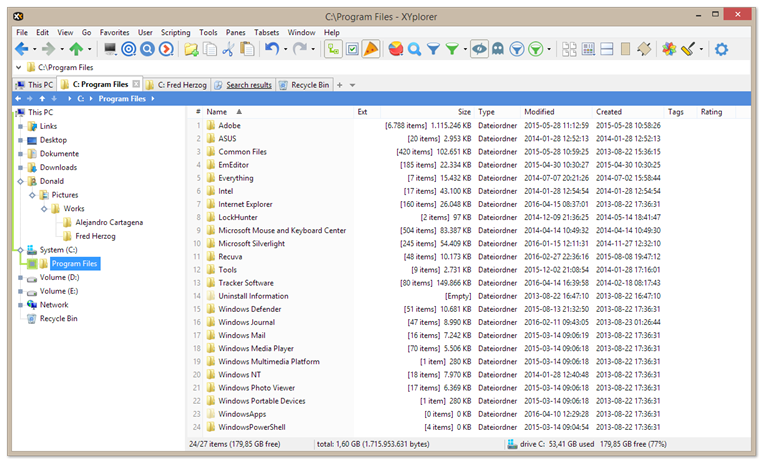 Since 2009 XYplorer supports assigning individual labels, tags, and comments of virtually any size and number to any file and folder (not just to media files). As seen in Dark Mode. Ctrl+Backspace pops up a breadcrumb that takes no screen space (it’s a pop-up menu), is 100% keyboard-driven, and takes you up and down (the latter based on the recent history) relative to your current location. Of course, you can also have Breadcrumb Bars. You can drag and drop a selectable text or data chunk from any other application onto a folder in XYplorer, where it will be automatically converted into a *.txt file or an *.rtf file, depending on the content. 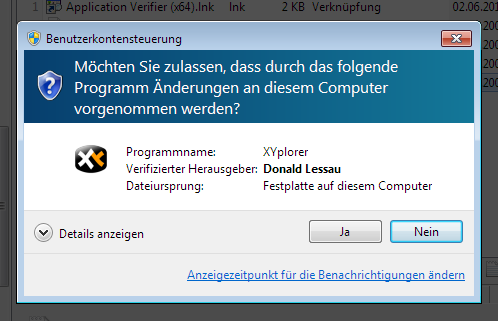 Yet another XYplorer-only feature. Drag and drop messages and attachments from Outlook and Outlook Express and save them to files with automatically coined template-configured names! 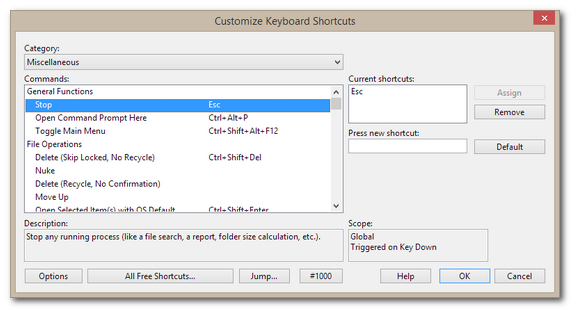 You get customizable keyboard shortcuts for more than six hundred functions. All of XYplorer’s keyboard shortcuts have been assigned by factory default, yet you can fully (re)assign them as you wish. You can use any combination of Ctrl/Shift/Alt (incl. none) with almost any key on your board, and can assign as many different shortcuts as you want to each of the functions. The shortcuts are saved in a separate file (ks.dat in application data path) that can be distributed among users. 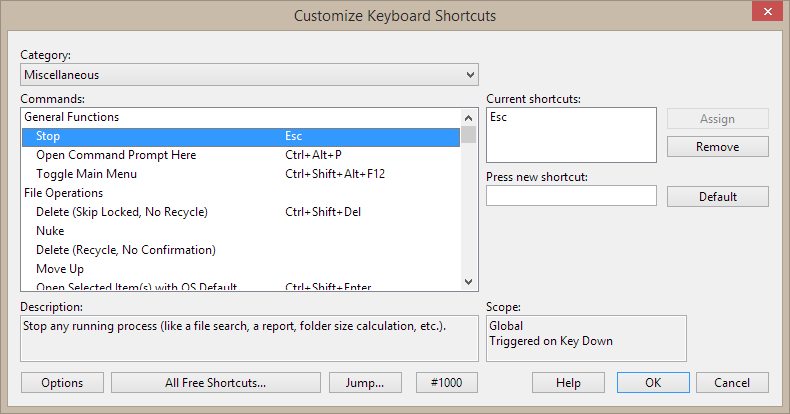 The Customize Keyboard Shortcuts dialog closely follows the de facto standard for such interfaces in Windows applications, so you’ll immediately find your way. With some useful additions: There’s a short descriptive text for each function, and you can create a "cheat sheet" of all current shortcuts and commands in various layouts. It will generate a list of all items (under the current path) with names longer than 256 characters. FYI, the /r switch makes it a recursive search (i.e. a search including subfolders). Note that you can show a column "Len" which shows the actual length of each file name right in the list (see next paragraph). An optional "Len" column shows the length in characters of each file name (incl. 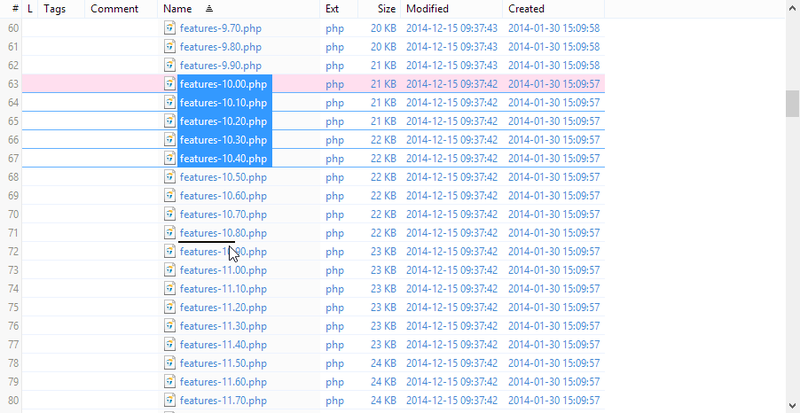 full path) right in the file list. 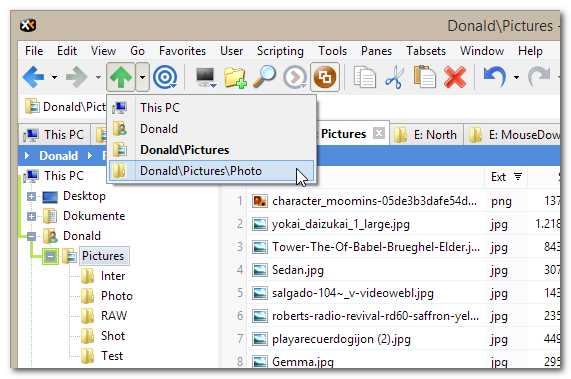 Now you can easily spot overlong file names that might make trouble when burning CD-ROMs. When renaming a file the pre-selected text in the rename box will not include the extension. A clever little feature but extremely useful because you almost never want to change the extension when you rename a file, right? After pressing F2. Tip: Press F2 again to take away the selection. 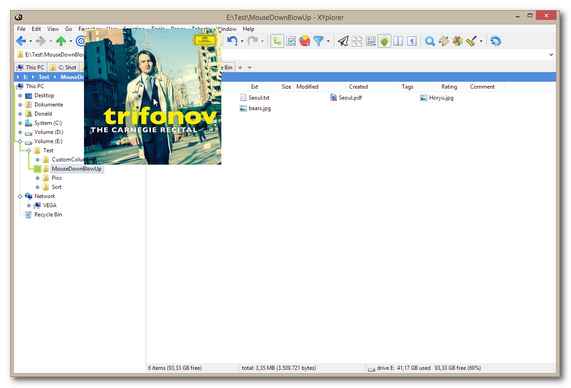 Historical note: This functionality has been added to XYplorer (then still called TrackerV3) in February 2000 (v3.02.0040) and later was copied by many other file managers including Windows Explorer (Win7) itself. 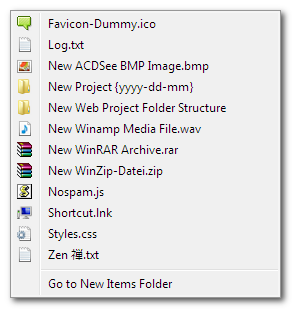 In the context menu of each file you find a rich selection of rename options. 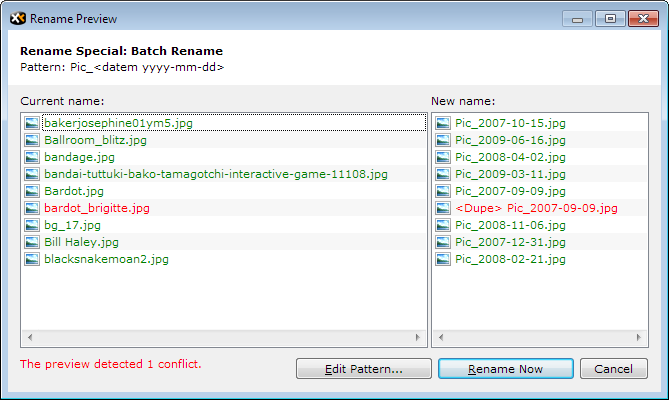 All batch rename operations come with a detailed preview, including detection of possible conflicts. Rename Preview for batch rename. Conflicts are detected before it’s too late. 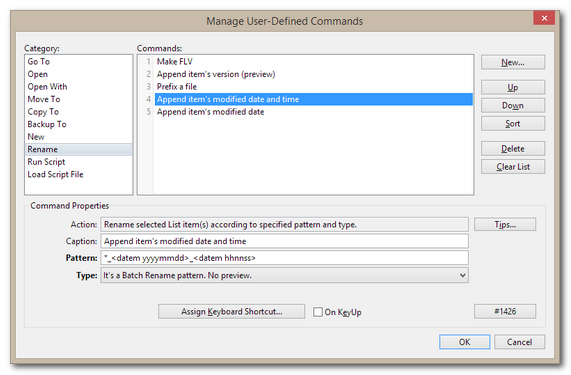 Note that the Multi-Level Undo/Redo also covers batch rename. You can have your photos or music files (or whatever) stay in the same position after renaming until you manually refresh the view. 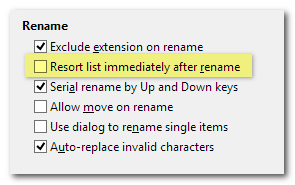 Simply uncheck the option "Resort list immediately after rename" and Auto-Sort will not happen. You can directly manipulate the displayed order of items by dragging them to a new position. This is also known as arbitrary sorting. 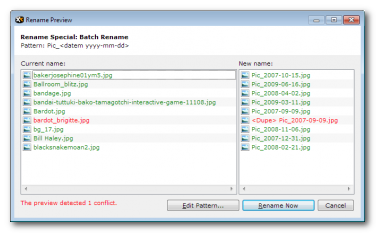 Very useful together with batch rename operations. Write your personal file management routines in the most user-friendly way. Go To, Open, Open With, Copy To, Move To, Rename ... wrap those tasks into UDCs, and have them magically appear in the new "User" menu. Give them catchy captions, and assign keyboard shortcuts to them. UDC means: Reduce your daily routines to simple keystrokes! ... and a new menu item is auto-magically created! Now you may assign keyboard shortcuts to this item as you like. Of course, the number of UDCs is not limited, they are retained between sessions, and they are portable between computers. As always, no registry is involved here. Create a fully formatted HTML document containing the list of files you are currently looking at in your file manager, with a single click. Look up the title of the currently selected file in the IMDB (Internet Movie Data Base), with a single click. Convert all Umlauts contained in the currently selected text file, with a single click. Transfer the content of your digital camera SD card in its new folder renamed by today’s month, with a single click. 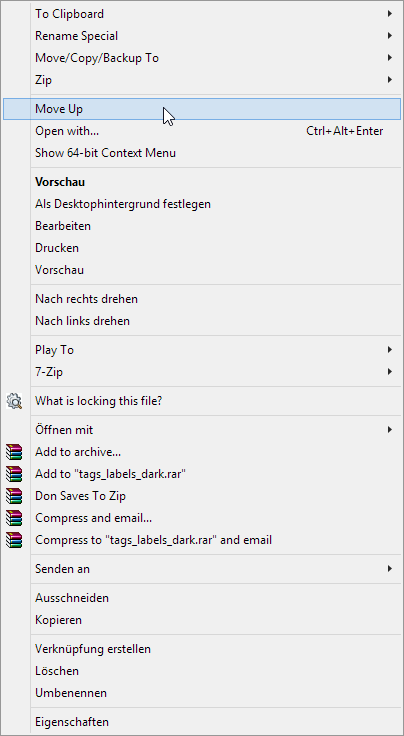 Save all last years .doc files in a zip file named doc_backup_07.zip, with a single click. Download a specific file from internet without using a browser. Open the first URL contained in the clipboard. Copy any file on your computer to "here" (to the current working directory). XYplorer makes your double-click portable! It can maintain any number of private portable file associations independently of the global ones defined in the Windows registry. 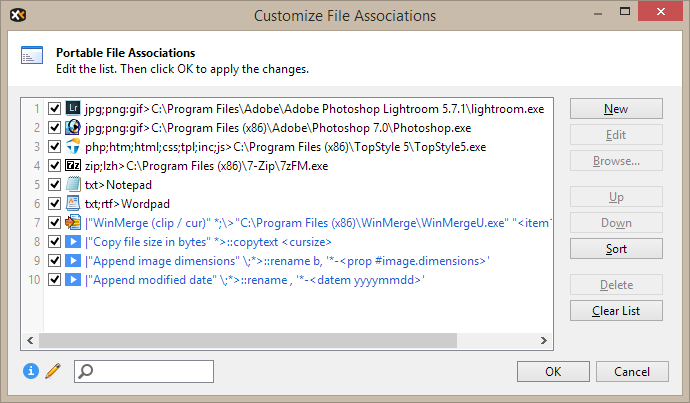 These associations are stored in the app’s local INI file, which allows you to travel with your own home-grown file associations. Keeping the promise of thumbdrive file management: Home is where your double-click is! Network servers can be cached and remembered between sessions! This means: (a) Servers load at the speed of light; (b) Servers outside the primary workgroup that have been entered via Address Bar are remembered and don’t have to be entered ever again; (c) You can easily add/remove servers to/from My Network Places and thus list only the servers you actually need for your daily work. Show only the servers you need to see, and show them in no time! No more scrolling through the 3,629 servers in the company network. 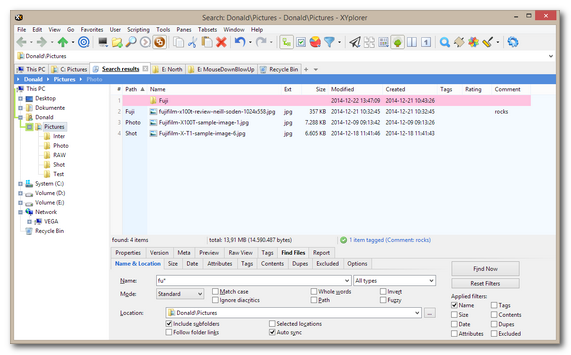 Apply Visual Filters to the file list. Control what you see by stating simple wildcard patterns like *.txt. Multiple Patterns, Inversion, and Regular Expressions are supported. 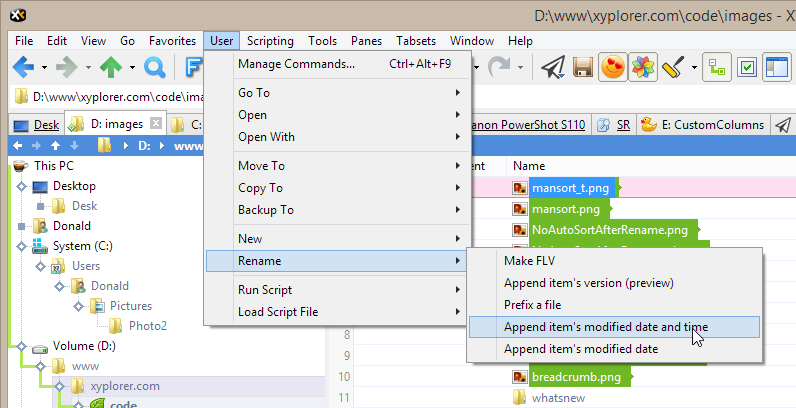 The Visual Filters are per-tab and, as virtually all XYplorer settings, retained between sessions. A fully portable and easily configurable "New Items" menu that vastly surpasses the possibilities of Explorer’s "New" menu. It’s you who decides which items are listed in this menu. First you create any files, folders, or whole folder structures (with or without contents) of your own choice within a predefined application folder called "NewItems" (Edit | New Items | Go to New Items Folder). These will function as the sources for creating your new items. 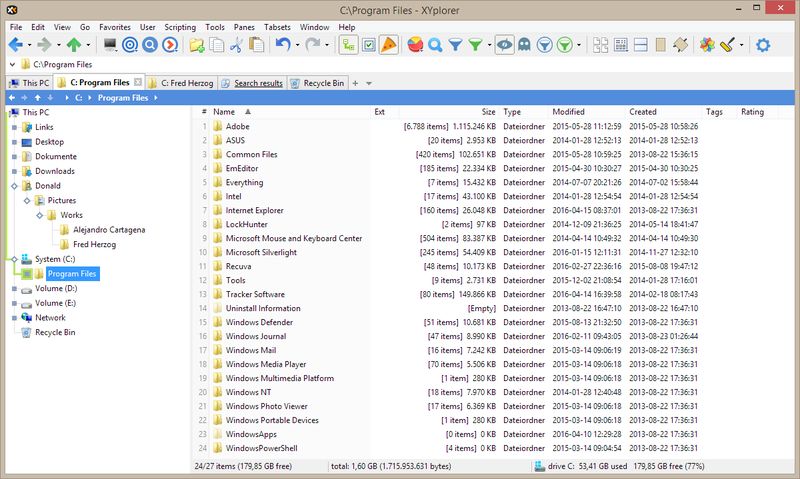 On startup XYplorer scans this folder and fills the submenu Edit | New Items with all items found in this folder. 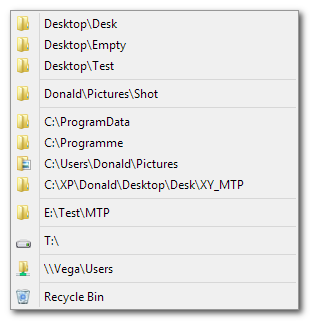 Then a simple click on one of these menu items will create a copy of the file, or the folder, or the folder structure in the current location. It’s a "Copy this here now!". Quite a time saver. "Rich File Operations" is the tag for copying (resp. moving) items with their folder structure. Rich Copy/Move is a highly useful feature for archiving specific subsets of search results. It enables you to copy/move files to a destination along with their folder structure, i.e. whatever directories are needed are automatically created under the destination path. You get a perfect image of the files in their original location. 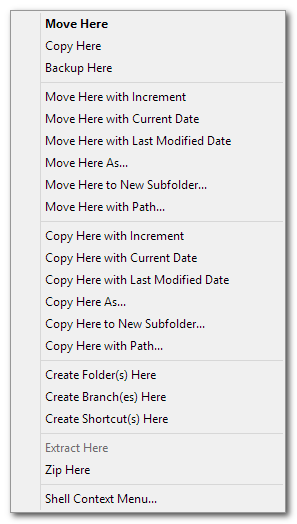 Note that you find the Rich Copy/Move Here commands only in the drag and drop context menu. To do a Rich Copy, drag the selected files from the find results list to the destination in Tree using the right mouse button: on drop, a popup menu will give you the choice between normal and rich operations. Of course, Rich File Operations are only meaningful when your File Find includes subfolders, else there is no folder structure present in the find results. Commands like Backup Here, Move Here to New Subfolder, Copy Here to New Subfolder, Copy Here As..., Create Folder(s) Here, Create Branch(es) Here (also known as "Copy Folder Structure"), Create Shortcut(s) Here, Extract Here, Zip Here, and Go to Dragged Item can be real time savers. 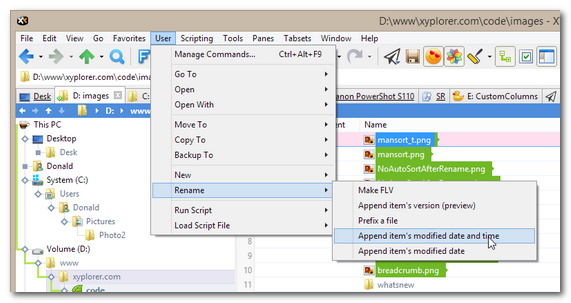 For many users they are some of the most used commands in XYplorer. Note that you can toggle this menu here: Configuration | Menus, Mouse, Safety | Context Menus | Custom drag and drop context menu. 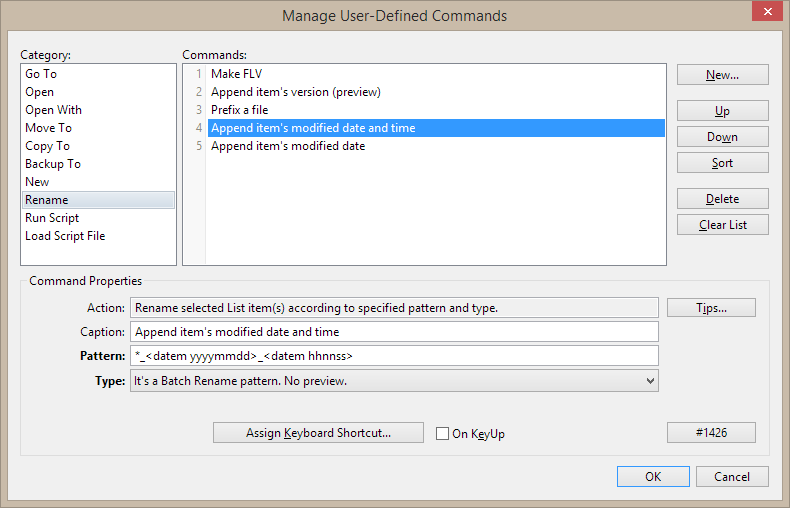 Modified Date, Created Date, and Accessed Date are shown right in the file list. Optionally in the unique Age format, which immediately tells you how old a file is (as opposed to when it was born). Generate various sorts of file system reports, to popup, to clipboard, to file, or to printer. We’re talking about one-click directory print-outs here, right from the Report tab in the Info Panel (F12). Showing the pics and the info all in one view. 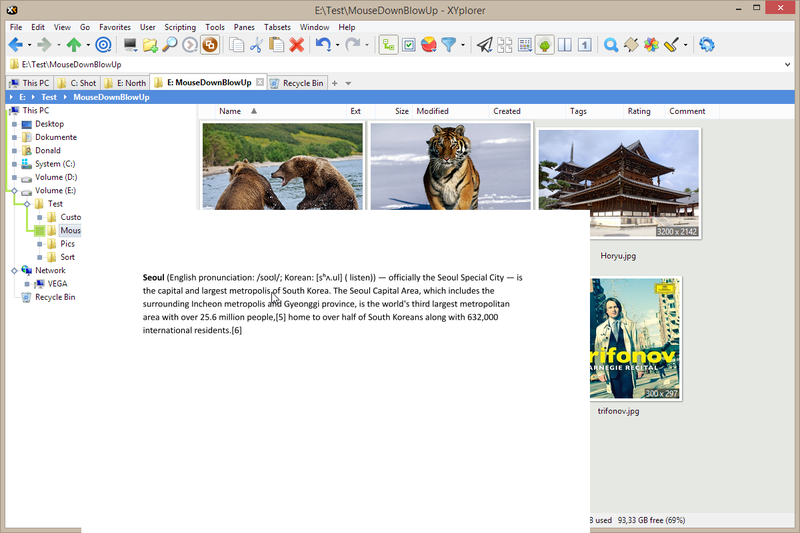 Note that the size of the thumbnails is configurable, and, even better, the thumbnails support Mouse Down Blow Up (see here below). 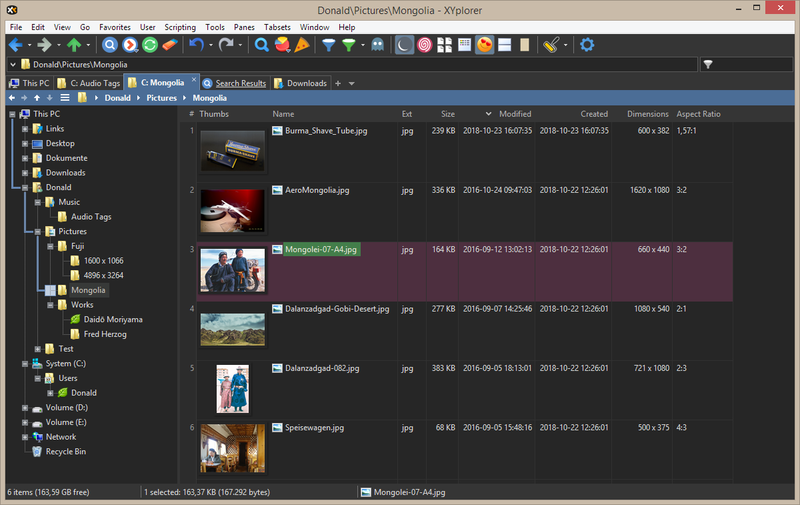 By the way, thumbnails caching in XYplorer is unlimited in size and duration. Cache once and your cache will live forever. And all sorts of thumbnails can be cached: images, movie stills, PDF, etc. 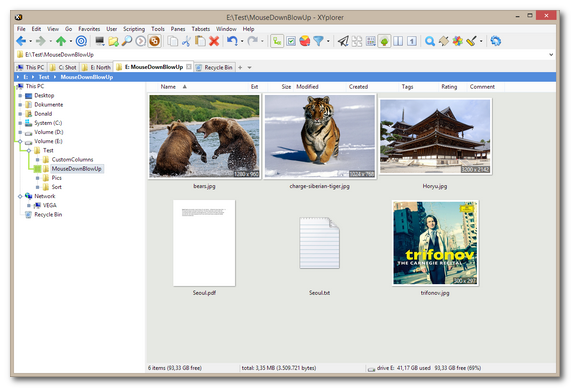 Thumbnails, Tiles, File Icons, and Image Previews all support the unique "Mouse Down Blow Up" (MDBU) functionality: You can pop up an image in original size just by holding the left mouse down on the thumbnail (tile, icon, preview). The pop up zooms exactly into the point where you downed the mouse. If the image is larger than the screen you can pan it by moving the mouse while holding it down. When you release the mouse button the popup disappears. Mouse Down Blow Up can be configured in Configuration | Preview | Mouse Down Blow Up (see also here) and in Configuration | Thumbnails. For thumbnails of animated GIFs the popup instantly displays the animation. You can as well pop up textual contents of TXT, DOC, DOCX and many other formats, see also here. 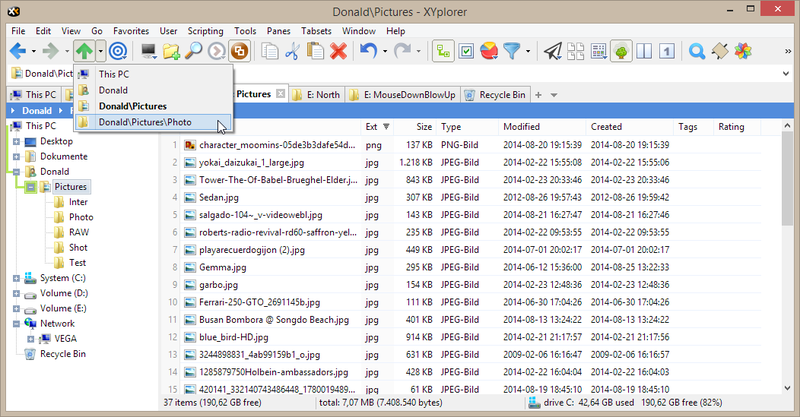 ... and finally on the icon of an image file in Small Icons view. There’s never been a faster way to check the contents of a file. 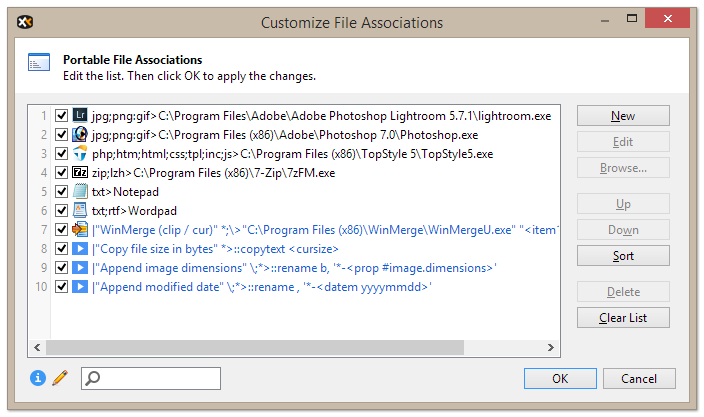 Quickly edit any or all file dates (Created, Modified, Accessed) or the file attributes (e.g. Read-only, Hidden) of all selected files. From 12.50 onwards time stamping supports milliseconds and even a resolution of 1/10 of a microsecond. Type the new file times right into the edit boxes on the Properties Tab. You are in full control. 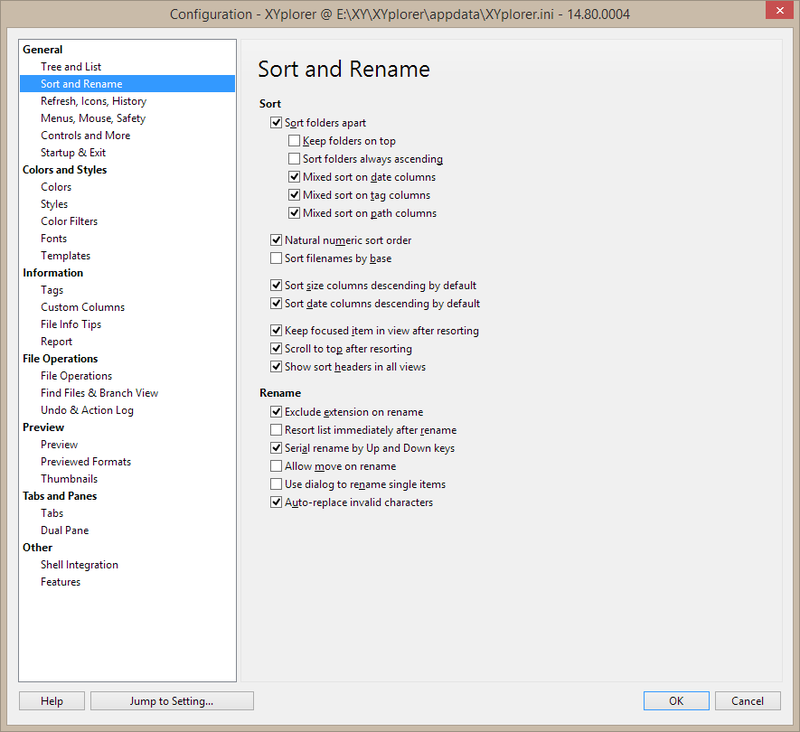 Easily choose what is sorted how and in which direction in menu Tools / Configuration / Sort and Rename. Preview of *.TGA (Targa), *.DNG, and *.NEF files. 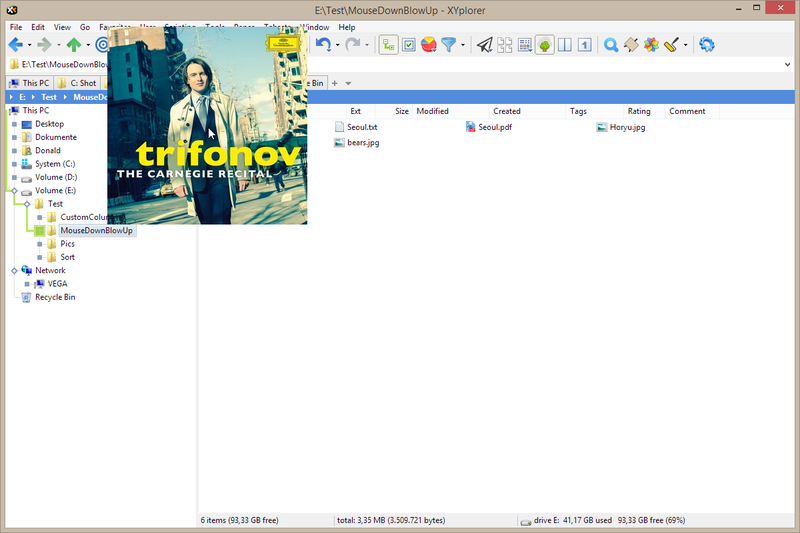 Instant Font Preview of installed and uninstalled TrueType and Type-1 font files (displaying detailed font information). Instant Preview of Office files (except in Vista/Win7), and of HTML, MHT, PHP files (including configurable server mappings) with printing option. 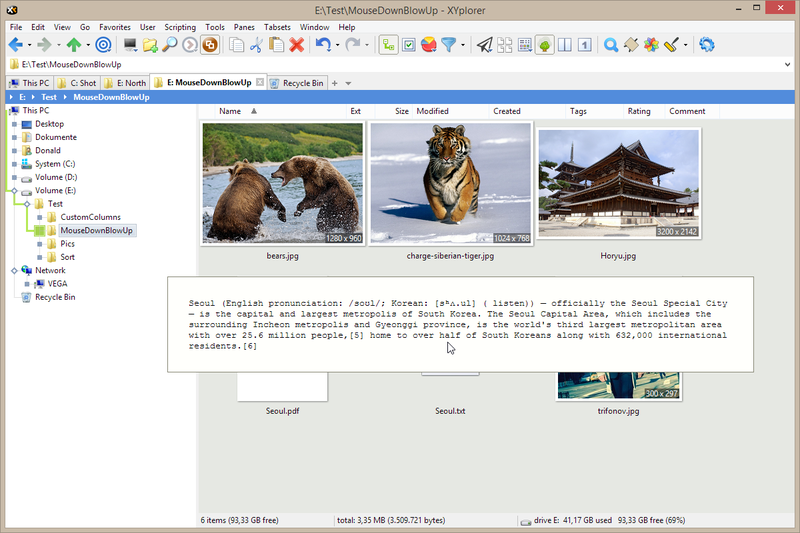 Support of Icon Overlays (as for example used by TortoiseSVN, a Subversion client, implemented as a Windows shell extension). Special MP3 service: instant ID3v1.1-tag view and edit, plus automatic file name to ID3v1.1-tag routine. You have a Column-wise Selection Filter. Which means you can not only e.g. select all GIFs by entering "*.gif", but "modified:*2007*" selects all items Modified in the year 2007, and "type:Vis*" selects all items of a Type starting with "Vis". Instant Raw View (ASCII and HEX) for all files, including text extraction from binaries (the fastest on the market since years). 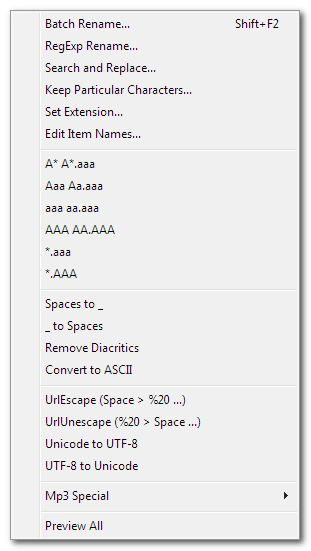 Autosize Columns: Optionally, file list column widths automatically adjust to their current contents. Simply tick menu Tools / Customize List / Autosize Columns. On-the-fly Font Sizing: Hold CTRL and wheel your mouse to quickly change the application’s font size to either see more information in the same space or go for more detail to relax your eyes. Support for showing directory sizes. 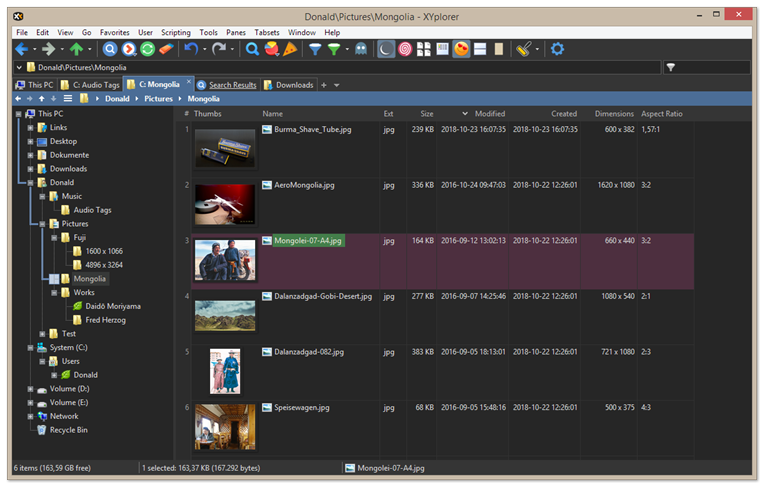 Many are missing it in Explorer, here it is: The total size of each folder including all of its contents can be seen right in the file list. Optionally you can also display the number of items in every folder. Folders Sizes shown. 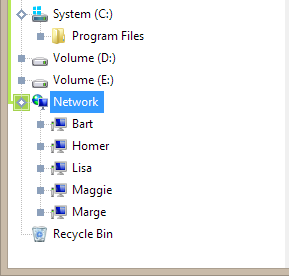 Empty folders are marked by "[Empty]" (configurable). Optionally, for each file and folder, the real disk space used is immediately displayed. Start Where You Stopped: Remembers last folder, sort order, scroll position, column widths, and selected files per-tab and cross-session. Browser-like history functionality. There’s a global history and an individual history for each tab. Can define favorite folders and files. Extended Context Menu: A large suite of useful commands added to the standard file context menu, including Copy To, Move To, Copy File Name with Path, Copy File Properties, Copy Large/Small Icon, Multi-file Rename (optionally using Regular Expressions). Full support for drag and drop and wheel mouse. The main development goal is to create, maintain, and improve an application that saves your time, energy, and money. XYplorer’s development is under constant supervision by a board of highly qualified power users, hence you can count on a high degree of usability, stability, and reliability. Fast and easy handling. Less than 20 seconds from unpacking to using. No plugins needed. 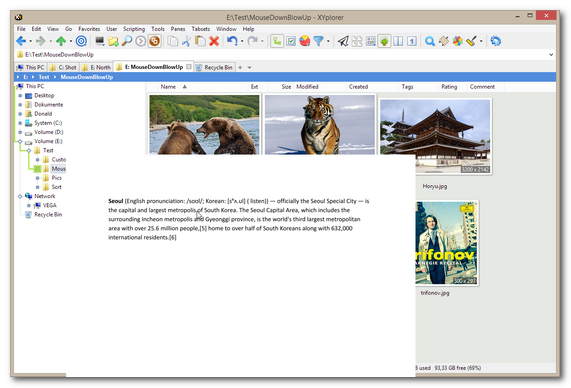 Interface closely follows Explorer standards. Intuitive handling, no reading necessary. Start working in no time. Simple key-based registration, 100% trouble-free. No DRM hassle. Paying customers are not treated like pirates. 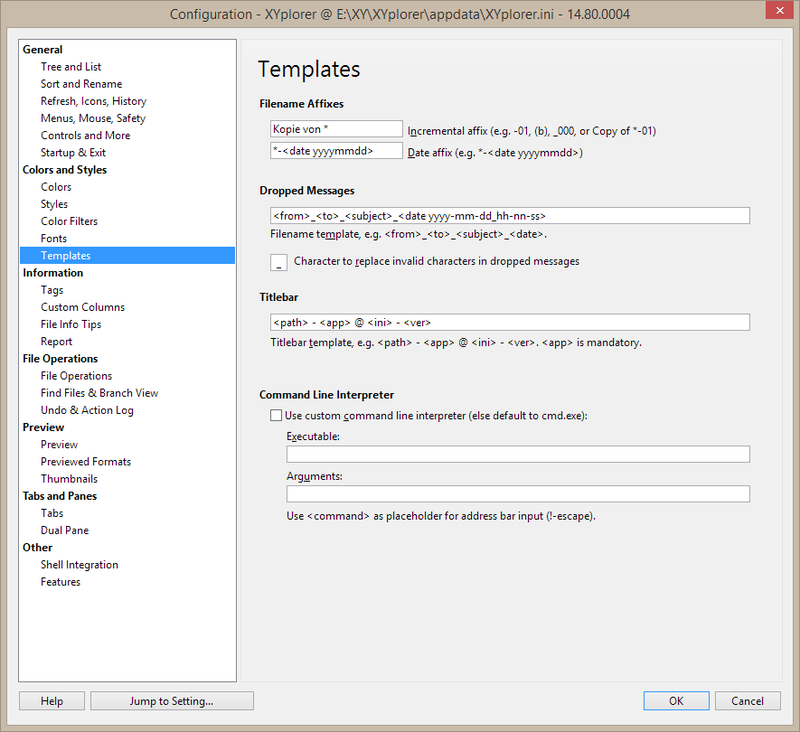 By the way, XYplorer is pronounced X-Y-plorer or Zaiplorer. Friends call it XY. You choose.